This beautiful verdure "The Hunting Trip" tapestry based on the works of the 17th century verdures, we see hunters on a hunting trip pausing by the lake. The hunting party includes a romantic couple as well as their horses and hounds which were used for hunting in the 17th to 19th century Europe. The verdure details are seen in the foliage and leaves. The trees contrast beautifully with the muted background of lakes, forests and mountains. 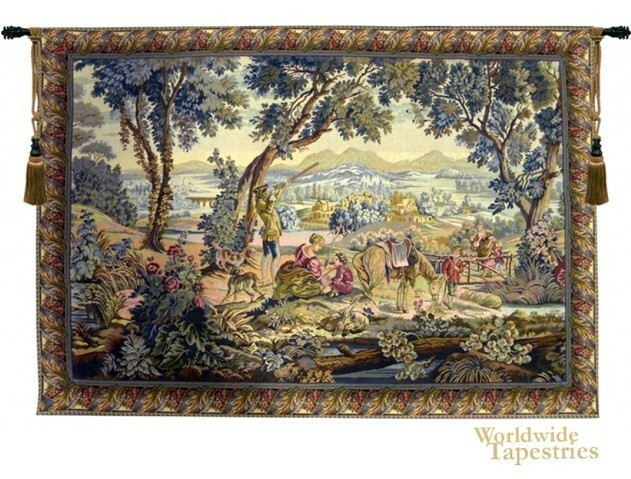 This landscape verdure tapestry "The Hunting Trip" is backed with a lining and has a tunnel for ease of hanging. Note: tapestry rod and tassels, where pictured, are purchased separately.